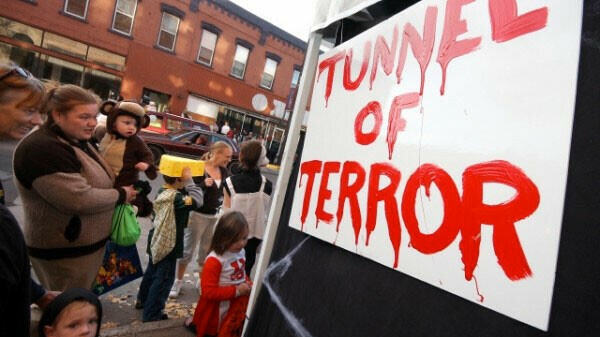 Right now the Volume One staff is trying to decide if we can pull off another “Tunnel of Terror” outside our office during this year’s Downtown Trick or Treating event on Friday, October 28. This is where our entire staff spends most of the day building an impromptu “terrifying” tunnel for kids to walk through, peppered with our editors, advertising reps, designers, programmers, and interns all dressed up in their favorite masks and costumes. We did it for three years starting in 2007, but had to suspend terror operations last year as we were furiously finishing our Local Store (which was supposed to open just a day or two later). Regardless if we decide to do it this year or not, it’s an amazing couple of afternoon hours for downtown as THOUSANDS of costumed kids and their parents descend on local businesses to pillage hundreds of dollars worth of candy from each one. It’s quite a sight to behold. Whether you have kids or not, consider strolling the street that afternoon just to take in the bizarre sight of it all. I promise it will help get you in the Halloween spirit just in time for the weekend. Maybe I’ll see you there. I’ll be the one in the creepy mask.